Embue Cloud + Network Architecture™ delivers smart apartments for residents and building intelligence for owners through its portfolio-wide dashboard and in-building network. Embue Super™ gives building owners and managers control over and information about their buildings’ equipment and indoor environment while giving residents the smart home experience they need to meet their expectations. Embue Remote™ is the smartphone app for residents to access their apartment controls: thermostats, sensors and leak detectors via their smartphone anytime or anywhere. 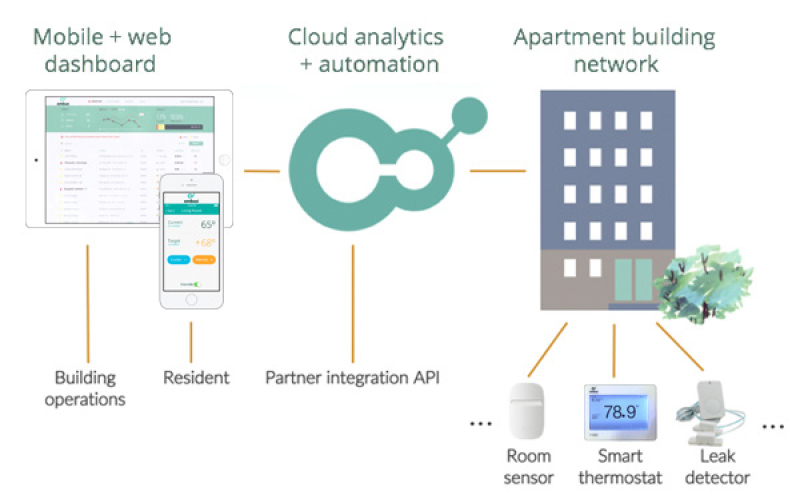 Embue is the first cost-effective cloud-based connected portfolio-wide solution to combine per-apartment equipment control, receive alerts and remotely control devices from anywhere and anytime. Embue's network infrastructure solution is what make predictive analytics possible for equipment monitoring and real time energy savings. We have patents pending on our networked architecture, control algorithms & analytics.